Hiyarant, or rather Stuart Vermaark, is a name synonymous with “deep south” psytrance. Hiyarant is married to wife and collaborator, Lili Myzo, who forms the second-half of his cutting-edge live act, Hiyamyzo. Having been signed with labels across the globe such as Global Army Music and BioMechanix Records (Mexico), Hiyarant is one of South Africa’s most talented and accredited producers. His other projects include Enough Weapons alongside Dave Love, as well as Dirty Motion in collaboration with Frozen Ghost. Hiyarant is also the co-owner of the highly successful Disasterpeace Records. Catch him live, on his home turf, at The Valley of Psy on the 19th of July. These questions were compiled by Batia Efrat on behalf of Psyked in the City. It’s 9.00 on Saturday morning and after much anticipation, we are on route to Origin Festival. It’s my first time so I can’t contain my excitement. I ask, “are we there yet?” about twenty times. When we finally arrive at the beautiful Elandskloof in Helderstroom, I’m greeted by an awesome shaded camping spot, the lush forest and a little dam to enjoy later. We hurriedly pitch our tent, eager to hit the dancefloor. When we enter the jungle-like Beats Stage, Travisto is in the DJ box pumping his melodies. The vibe is infectious; Djs throw lilos into the crowd and everyone is smiling. Then the beat drops and I feel like I’ve finally come home. I’m chilling next to the dam with the other party-goers merrily soaking up the sun. Before I know it, the Spanish muso, Elrow‘s on stage for a special session featuring Toni Varga and De La Swing. I’m on the dance-floor jamming beneath the trees; and I’m in love with the festival already. We head for the Origin Floor, but I’m lured into the Chill Zone. I have a chance to admire Artescape‘s handywork. The décor is unbelievably beautiful (possibly the best I’ve seen all year) and the mountains are a magical backdrop. Psychedelic paradise calls out to me. I reach the dancefloor just as Bayawaka starts up the music, followed by Ryanosaurus and Renegade. Static Flow takes charge as the sun is setting and I’m in my happy place for sure. The Commercial Hippies ravage the dancefloor at 21.30, playing their killer Lark remix. The crowd’s sent into overdrive. Regan is up next. And although I’m loving the vibe, I decide to make a mission towards the Beats Stage again to watch Secret Cinema in action. I marvel at the LED light projections in the oak treas. The visuals are amazing. I bid a silent thank you to The ExtraDimensional Space Agency. Mid-night draws near and it’s time for Brazilian Digoa to rock the Origin Floor. He’s incredible in the Dj box and his killer set has people talking throughout the event. All of a sudden, it’s two in the morning and things are getting quite dark. So I take a stroll to see what kind of storm Spekta is cooking up. Moments pass before Pete Bones gets behind the decks and elevates things to a whole new dimension. I’m blown away by his smooth techno style. The atmosphere is friendly and ecstatic, and stompers are responding well to his tracks. But I’m feeling tired, so I jam until my feet give in and decide it’s time for some shut-eye. I awake the next morning as Dala is finishing up. I hear his majestic tunes in the distance and shun myself for not being on the dancefloor. I grab breakfast on the way, fresh and ready for a Sunday session with Groove Addict. It’s a great morning workout, stomping in the sunshine. I almost lose track of time. But when 10.30 eventually rolls around, the excitement is indescribable as LOUD gets onto stage. The dynamic duo is greeted by the cheers of their die-hard fans. LOUD blasts beat after beat. And I am compelled as they play their new Afrika 101 track. I’m certain that this is bliss. Soon it’s Headroom‘s turn and HOT DAYUM, his beats are banging! Broken Toy doesn’t disappoint either. He gets behind the decks. spinning his epic Commercial Hippies “Dr. Rocket” remix for the first time, causing chaos on the dancefloor. Just when I think it can’t get any better, LOUD returns to end the party off on the highest of notes. I’m enjoying the experience so much, I don’t want it to end. When I finally do head home on Sunday evening, one thought resonates in my mind: “Origin, you know how to party!” Huge thanks to the organisers and everyone who made it happen. Like this review? Please share it with your friends! There is only one week to go until Origin Festival returns. So get yourself ready for a weekend full of psychedelic music, art and culture. Only 125 km from Cape Town, the lush green Elanskloof venue is home to fresh mountain streams and a magnificent forest open to explore. If a backdrop of towering mountains entices you, Origin is a journey you should embark upon. Party-goers can expect only the best selection of psychedelic music, incredible international acts and outstanding production. The ExtraDimensional Space Agency has come all the way from the UK to create an LED show unlike anything Cape Town has seen before. Origin admits that this is their biggest lighting installation yet. This is great news for the night-owls among us. But the sunshine-loving stompers need not fret; Artescape will once again be bringing the festival to life in the Psychadelic Temple with top-class décor to aid an incredibly sensory experience on the dancefloor. And if the eye-candy Artescape created at Rezonance is any indication, we can expect nothing short of perfection. However important the visual elements are, the music remains the main attraction. Back-to-back acts from top-class Djs on not one, but two dancefloors ensures that there’s something for everyone, no matter what your taste is. 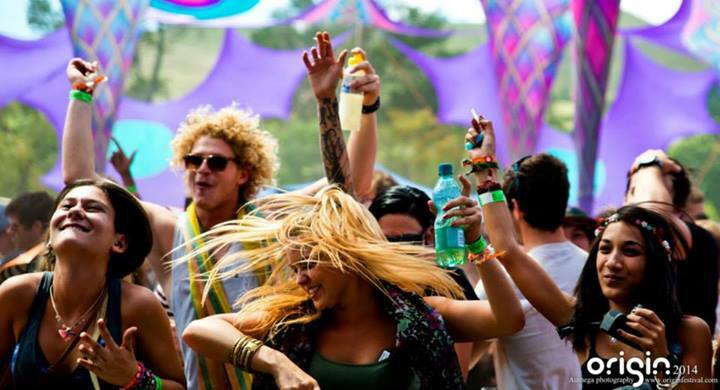 On the Origin Floor, you can expect only the best psychedelic trance from groundbreaking international acts such as LOUD from Israel, Groove Addict from India, Ryanosaurus from Australia and DJ Digoa from Brazil. But let’s not forget our beloved locals Headroom, Broken Toy, The Commercial Hippies, Sad Paradise and Portal (to name a few) who will be bringing their beautiful beats into the mix. If you prefer something more laid-back, Origin’s Beats Stage is the place to be. Situated amongst the trees and right alongside the river and pool, it is there you can enjoy everything from funky techno to tech house to psybass and chillstep. Prepare your ears for the melodies of Secret Cinema from the Netherlands, and enjoy a special Origin session featuring Elrow from Spain in conjunction with Marc Maya, Toni Varga and De La Swing. One thing you can be sure of are the captivating tunes that will serenade the crowd all the way through. And to lure creative and contemplative souls, the Visionary Art Gallery will be open to marvel. Featuring acclaimed artists from South Africa and beyond, this is a fine opportunity to take a gander at authentic artistic talent, mid-party. The works of Aumega, Ed Babb, Oliver Barnett, Andriod Jones and Amanda Sage will be exhibited at the gallery. There are only a few more days to go and quite frankly, we can’t wait. Click here to buy your ticket online to avoid missing out. Just to tantalise your taste-buds, here is the inside-scoop on one of the headlining acts for Origin 2014: LOUD. Who are the brains behind such banging beats, you ask? Meet Israeli-born Kobi Toledano and Eitan Reiter. Together they’ve been producing original electronic music since 2006, blending old school elements with cutting-edge, new sounds. These guys don’t just adhere to formulas, they pave their musical way with originality and enthusiasm. Having collaborated with the likes of Union Jack, Hallucinogen, Son Kite, Astrix, Perfect Stranger, Shulman, Prometheus, Ace Ventura, Domestic and Shulman, LOUD has earned the respect of many lading musicians and producers. When it comes to their beats, they share one simple philosophy: Play it LOUD! Catch them live in the flesh at Origin this weekend. Find the lineup here. The following video is am 8-minute long documentary compiled by LOUD featuring a range of festivals they performed at during their summer tour in 2012, including Boom Festival and Ozora Festival. Listen to more on Soundcloud: LOUD.